In most ways, as evidenced in the well-directed, perfectly cast, beautifully choreographed, and impressively scored music, Sternfeld was right. The CTP’s Jane Eyre is special. Gabriel Firestone’s simple, ever-changing set, focuses the action into a compressed proscenium within proscenium, forcing the audience to focus on the actions. Simplifying the set even more and depending more on subtle electronic graphics would help. Benjamin Gantose’s dark lighting and Sydney Gallas’s period-appropriate costumes enhanced the somber mood. Former public toilets at a Brontë country beauty spot also went under the hammer at the auction, selling for £55,000. The stone toilet block, at Penistone Hill, off Moorside Lane, which was only opened regularly during the summer, was closed by Bradford Council due to budget cuts in 2015. Efforts to find another organisation to take the toilets over proved unsuccessful, with Haworth, Cross Roads and StanburyParish Council also lacking the funds to take the facilities over. ITV’s luscious Becky is pardonable because it comes with the territory. Think what the large and small screens have done with Charlotte Brontë’s “plain” Jane Eyre. Mia Wasikowska, in the most recent movie version, is plain? Not if she tried. Gloss is the biggest pot on the TV adaptor’s paint shelf. Yet Hughes has been careful to respect historical difference. Becky is not a feminist warrior before her time. The concept, in 1848, would have been an absurd anachronism. She is a seductress — and not just of men. “Jane Unlimited” begins as an ordinary book about an ordinary girl who grieves the death of her mother-figure aunt and is unsure of where she wants her story to go. Yet, almost immediately the reader can tell the novel is anything but ordinary. Jane’s uncertain path unravels into a mind-boggling assortment of alternate dimensions that include art theft, miniature velociraptors, magical portals and a house hunting for someone’s soul. Film: God's Own Country. (...) The film feels like a brooding, windswept fusion of Wuthering Heights and Brokeback Mountain. One of the most widely held language peeves is use of the word "literally" in any sense other than "exactly according to definition." In recent years, the meaning has shifted from its original meaning to one that means "figuratively" — essentially, the exact opposite meaning. But it turns out that development isn't nearly as recent as most people think. "Literally" has been used to exaggerate for hundreds of years in English, including by esteemed authors like Charles Dickens, Charlotte Brontë, F. Scott Fitzgerald, and James Joyce. El Tiempo (Colombia) quotes Emily Brontë. The National (UAE) mentions the Loewe editions of Wuthering Heights. L'apprendista libraia (in Italian) reviews Emily Brontë's novel. Cathie Dunn writes... posts about Sue Barnard's Heathcliff - The Unanswered Questions Finally Answered? 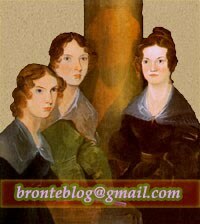 AnneBronte.org posts about Anne Brontë and education.